Ben Hughey, Grayson Lentz, Davis Lentz, and Zach Stevens make up a rising new band called Native. What do you get when you combine live, energetic rock and roll and a group of teenagers? Your answer will likely depend upon a few primary factors, such as your age and your personal taste for musical genre. But four high school students from Bluffton are redefining that image for the Lowcountry. Ranging in age from 15 to 17, Ben Hughey, Grayson Lentz, Davis Lentz, and Zach Stevens make up a rising new band called Native. But don’t call them a “boy band.” That description might fit their good looks, but it doesn’t begin to touch upon their dynamic sound and unique talent. At any of Native’s live shows around Hilton Head Island and Bluffton, you’ll likely see one boy band-like quality: plenty of enthusiastic young female fans amidst their diverse audiences. But you won’t hear any over-polished bubble gum pop music performed by young men dancing in unison around a stage. Native’s cover material includes a wide range of rock styles and sounds that pre-date the band members by years or even decades. At any of their shows, you’ll hear an eclectic mix of songs from classic rock bands like The Beatles, The Rolling Stones, Led Zeppelin, Jimi Hendrix, Grateful Dead, and Pearl Jam. Native also incorporates songs they’ve written themselves into their live shows. Their original music can be described as alternative rock but doesn’t fit squarely into one classification. “We don’t really sound like any one band in particular, but we have many different influences that come together into something that can be described as a mix of U2, Pearl Jam and Kings of Leon,” Hughey said. Adding to Native’s breadth of sound and depth of talent is the band’s wide-ranging instrumentation. Every band member is a self-taught musician, and the instruments played among them include electric guitar, acoustic guitar, bass guitar, drums, box drum, piano, saxophone, mandolin and harmonica. 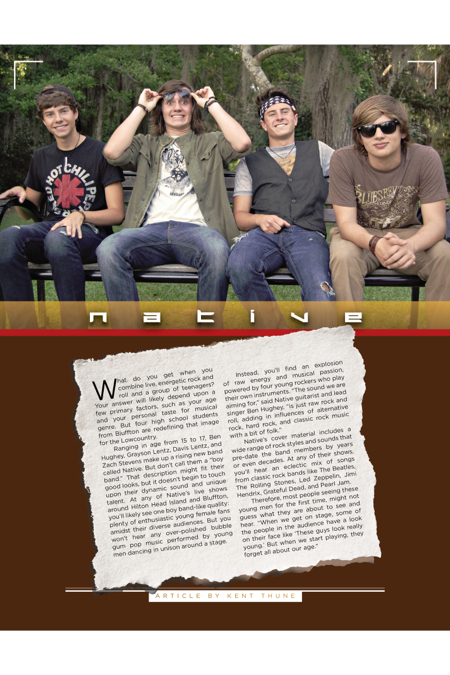 Having just played their debut show in May at the Bluffton Sunset Party at Oyster Factory Park to a large and enthusiastic crowd, Native has already played gigs at several venues around Hilton Head Island and Bluffton, including their most frequent gig at Freeport Marina on Daufuskie Island. When speaking with the band members, it is clear that the common denominator they share is their passion for music. “My main goal for the future of Native is to develop a reputation among locals, tourists, and other musicians as a professional band. For my future profession, I see myself working in the medical field, engineering, or playing music,” said Grayson Lentz, who plays bass, guitar and piano in the band. But if you catch Native at a live venue around the Lowcountry, you’ll discover that the talented young band members actually have found what they are looking for—to perform with integrity, energy and passion in front of audiences that are bound to leave the show thinking they witnessed something truly exciting and unique. Kent Thune is a musician, philosopher and a freelance writer who happens to be a money manager and owner of a Hilton Head Island investment advisory firm, Atlantic Capital Investments. He is currently working on a book to be published later in 2015. Follow his musings on mind, money and mastery of life at TheFinancialPhilosopher.com or follow him on Twitter @ThinkersQuill. It is refreshing to see young people take a real interest in real music. These guys obviously have the chemistry it takes to create. I wish them the best.